I normally don't complain about the much-harassed Norwegian railroad. I love trains, and one of my big complaints about living in Norway is that the country is so hard to build railroads in. I want much more of it. But today I realised that NSB really could be smarter than it is. I am trying to find a way to travel from Oslo to Karlstad. I know there are trains there. But NSB refuses to let me see anything beyond the Norwegian borders, and this is just at the other side, 2-3 hours into Sweden. When I use wideroe.no, I can book tickets all over the world, whether Wideroe or SAS fly there or not. With NSB I don't get any help if I want to pass the border. Perhaps it deserves some of the criticism after all? When I checked the Swedish railroad, going from Oslo to Karlstad (and back) was no problem at all. Go figure. Hey, NSB, how come the SWEDES can do it, and not you? There are a lot of dead blogs out there, and some of them are in otherwise live newspapers. The norwegian paper Dagens Næringsliv - a wannabe Financial Times, right down to the pink paper - has an impressive list of bloggers. Sadly, the last blogpost was written in 2007. This makes me wonder, again, about the weblog and its function in the public debate. In this case the high-profile, eminently competent people who were asked to blog obviously did not find it worth while to follow up the task. This, while others are still blogging in many a little corner of the universe, calmly talking from much lower soap-boxes in more remote corners of the online public sphere. Is the weblog the commoners' medium? Is the prestige gone out of blogging with the hype, now that the big agencies are all thinking about how to twist the power of facebook to their service? This week-end, things fell into place. I know what to do now. It's a really odd feeling, kind of a mixture between waiting for a dentist appointment and being in love. I have been trying to write abstracts for AOIR and the Nordic Media Research conference, but not successfully. Every time I have tried, I have ended up with this huge project that has been getting in the way of any small things, like papers and articles. The project is horribly ambitious, it's going to demand a network of researchers and lots of funding, and there's no way I can do any of it before either conference. But it doesn't want to go away. So, I am giving in to it. I am going to start planning a large research project. OK, fates, I am giving in, do you hear me? Stop nagging! And yes, that worked. Now that I have put the PROJECT into my schedule - my pretty immediate schedule - I can start working on other things. It's going to demand some compromise. I will, for instance, for the Nordic Conference of Media and Communication research, base my abstract on a talk I gave this fall. I have the material ready, the research almost all done, all I need is to write the paper/article. Easy-peasy, and I was planning to do that anyway. For AOIR I'll run with an idea I had quite recently - and nope, I am not announcing it here just yet. That would ruin the whole blind-review process. I'll let you all know if it's accepted :) If it isn't, I'll pretend I never meant to go to IR 10.0 anyway. It's in Milwaukee. How does one even GET to Milwaukee? Well, now you know. I just wanted to say this. A purely therapeutic blogpost for me, but at least you got links to a couple of conferences out of it. Have you typoed an url lately? Where did you land? The last times I have tried that, I have ended up in a site of mega religion cristian somethings, where the big news on the first site is something along the line that the bible is true. They now have testimonies proving that. I have to admit that while this is great advertising, I am shocked by the way one organisation, this time a very fanatic religious one, has been able to hijack the Internet. There must be a mechanism somewhere that redirects all typoes that would otherwise lead to a "file not found" to this site. How has it happened? Have they bought the spot? Can it be bought? If so, what did it cost? Or have they hacked it, planted a bug that infiltrates your machine, and then sends you off to their site, rather than just google search site or something. Are there thousands of religious fanatics that keep creating websites with typoed versions of every website out there, which then redirects to this page? Have they taken over explorer? Did Bill Gates receive Jesus in his heart, and started preaching through the error messages? It's quite scary. Fanatics are no more reassuring just because they are Christian. And yes, I deliberately did not use exact phrasing or links in this post. They get more than enough hits out of me as it is. I have started to look at electronic book readers, as I am one of those who like to write outside of the office, but the office is where my library is. Now, if I had a nice electronic book reader, that wouldn't be a problem, because I could just bring my books with me. Even if the limitation on the book reader was, let's say, 100 books, that meant I could empty it into an electronic library on a hard drive, and just bring the books I wanted. Or have them in an online bookshelf. It would really change my life. Why have nobody thought about this before? Perhaps the best supported electronic book reader is the Amazon Kindle, . It can contain about 200 titles, is wireless on the satelite band and so is always connected if you want to update newspapers or download books, and there are 230 000 books available. The weight? 300 grams. It sounds like a dream come true! The price? Well, not as cheap as a book, but 260$ I'd definitely pay to have all the books I need available all the time. Now, just as I was getting exited, I checked if I could get this in Norway, and use it in Norway. No. I can't. Bummer. Sony has a lovely reader though, and although it's a little bit more expensive than the Kindle, it looks very interesting. It's not as proprietary as the Kindle, reads more formats, which makes it a lot more available. My electronic journal access suddenly means I can download the relevant articles to the reader, and drag with me whole years of relevant publications to places where I'd never take a computer. What's that but major cool? From the webpage: "You can also create annotations with a virtual keyboard, highlight text with a stylus pen, search for text in your digital book, and easily adjust the font size." Oh yes, I'll happily shell out 300$, even now that the Norwegian krone has dropped, for the opportunity to carry 2-300 texts with me in the backpack when I am off to work elsewhere. This has to have a downside. "Note: Use of companion eBook Store limited to U.S. and Canadian residents. Certain titles may not be available for download based on place of residence." Lovely. This is probably why this item doesn't show up at all on the Norwegian Sony site. One should think that these days, with the tight economy, the enormous number of free hands and the need for cash flowing into the United States, buying things from abroad should be a tad easier. What are they afraid I'll read? Benjamin Franklin's autobiography? That I could read, if I want to, though. Manybooks.net contains 22,900 free e-books, many of the same as Project Gutenberg. If I mainly wanted the reader in order to always have a great novel available, I wouldn't worry about the restrictions, and just buy one. Come to think of it, that's a great thing to have. Thousands of books available to be packed into a tiny space. Would save a world of searching for English book-stores when we're on vacations. However, what I really want is the books we use, regularly, the ones standing in our bookshelves. The ones I have already shelled out thousands and thousands for, so I can have them close, and the ones I will pay as much for in the future. They are the books that stop me, when my colleague talks enthusiastically about a month in a remote village in Greece, to write articles. I would love the village, sure, but I'd not write much. This is why when I travel, I go somewhere with bookstores and libraries. I don't know exactly which books I'll need before I go, and the nature of my work makes it hard to write without a reference library. And it isn't available online. So, dear scholars, dear scholarly publishing houses: How about those electronic books? Wouldn't that be a great idea? No, that does not mean a herb-stealing, saronite-ninjaing gold miner, but an expert in quantitive data gathering in large databases. Such as, for instance, World of Warcraft. Would you like that job? Sifting through the information hidden in their huge storage sites, finding ways to gather, represent and analyse that huge stock of raw data, turning it into knowledge? Then by all means, apply for the job! The website for the Digital Arts and Culture 2009 conference is up. This year it's in Irvine, California, in December. Organiser and chair is Simon Penny. At times I feel like giving up on what we in Norway call "forskningsformidling" - popularising and communicating research. All the efforts done, nationally and internationally, to understand what gaming is and how it influences society are made invalid to the Norwegian debate by plain and simple lack of knowledge and critical sense in Norwegian media. Friday's news item on games at nrk.no is another example of amazing lack of a critical approach to certain opinions. Forgive me, English-language readers. The rest of this post will be in Norwegian. Fredag morgen, 6 februar, hadde Dagsnytt i NRK en nyhetssak om at kulturdepartementet setter av en million til opplysning om og forskning på problemskapende spillbruk. De sa imidlertid ikke "problemskapende spillbruk", de sa spillavhengighet. Mange mener dette er det samme, i alle fall ville en eventuell spillavhengighet være ganske problematisk. Imidlertid finnes det ikke noen diagnose som sier spillavhengighet. At norske media og enkelte grupper i den norske offentligheten, her representert ved NRK, på død og liv vil påprakke en gruppe en diagnose gjør den ikke til noen faktisk sannhet. Kulturdepartementet øker satsingen på dataspill, og jobber nå med en ny handlingsplan for å bekjempe avhengighetsproblemet. Forsknings- og opplysningsmidlene som Kulturdepartementet satte av var, slik jeg oppfattet Dag Asbjørnsen, midler som skulle brukes til å finne ut hva problemskapende spillbruk er, og til å spre informasjon om dette. Når NRK presenterer dette som om Kulturdepartementet endelig vil utrydde spillavhengighet vil jeg i alle fall se/høre kilden til deres utsagn. NRK påstår at et fenomen som er svært omstridt, og som spesialister som har arbeidet med feltet lenge avviser, er et faktum. NRK trekker fram, først og fremst på nettsiden, andre problematiske saker som alle på ett eller annet vis har blitt tillagt spillavhengighet, mens de ikke trekker fram saker som sier noe annet. Dette er en form for ensidig rapportering som er noe helt annet enn god journalistikk. Kanskje har NRKs reportere misforstått hva det vil si å være kritisk. Dataspillbransjen er i ferd med å bli veldig stor, og det er all grunn til å være kritisk til den. Et norsk eksempel er Dagbladets fokus på arbeidssituasjonen i Funcom. Internasjonalt er det flere ganger rapportert svært dårlige arbeidsforhold for ansatte i ulike spillfirma. Lange dager, lav jobbtrygghet og dårlig arbeidsmiljø er ikke uvanlige forhold for ansatte i bransjen. Med tanke på de svært mange programmererne og designerne som spesialiserer seg mot spill i norske utdanningssinstitusjoner er det grunn til å spørre om ikke nyhetsmedia forsømmer sitt samfunnsansvar når all kritikk av spillbransjen handler om kritikk av spillenes suksesskriterier, og ikke for eksempel ser på de framtidige arbeidsforholdene for alle disse entusiastiske studentene. Det er all grunn til å spørre hvor pengene for spill går: hvem tjener på spillene? Spillbransjen er adskillig mindre dekket på dette feltet enn for eksempel musikk- og filmbransjen, og det sier ganske mye. Store multinasjonale selskap kjøper opp gode ideer og gjør dem til sine egne. De tar også over ideer gratis, ved at spillernes innsats integreres i spillene uten at de får betaling for det. Svært mange entusiaster arbeider mye med å gjøre spillopplevelsen bedre for seg selv og andre, og dette er gratis arbeidskraft for spilleiere som allerede tjener godt - hvorfor finnes det ikke et lett tilgjengelig system for å belønne denne innsatsen? Forskerne får ikke tilgang til opplysninger om spillermassen, om sentrale element i utviklingsprosessen og om arbeidsprosessene i produksjonen: Er det akseptabelt at så store organisasjoner er så lite tilgjengelige for innsyn? Dette er kritikk av spillbransjen som blir helt oversett i journalistenes "kritiske dekning av dataspill." Det er ganske enkelt å forstå hvorfor dette skjer. Det er veldig lett å finne folk som spiller mye, og andre folk som er bekymret for disse. En hvilken som helst journalist kan prate med foreldrene til noen ivrige dataspillere på ungdomsskolen, og vips har de en "kritisk sak" til et stort og kjent fenomen. Det er adskillig vanskeligere å sette seg inn i sosiale, økonomiske og politiske forhold som spillene blir produsert innenfor. Det vi får er dermed en situasjon hvor journalistikken stempler en stor gruppe svært aktive spillere, påfører dem en ikke-eksisterende diagnose og er med på å rettferdiggjøre noe som kan være overgrep og frihetsberøvelse i godhetens navn. Når barn blir tvangsinnlagt på grunnlag av avvikende adferd blir det vanligvis knapt nok omtalt i pressen. Barn og ungdom har svært få rettigheter når deres foresatte ikke er fornøyd med deres adferd. Det hjelper ikke denne allerede svake gruppen at det blir akseptert i nyhetsmedia at enkelte blir tvunget til å kureres for adferd som vi faktisk ikke vet er det faktiske problemet, eller bare et symptom på helt andre og adskillig større problemer. Nei, jeg kritiserer ikke pressen for å stå på sin rett til å skrive om at mange bruker spill på en måte som bidrar til problemer, nå og i framtiden. Jeg kritiserer pressen for å ikke oppfylle sin plikt til å se på hvordan den utøver denne retten. 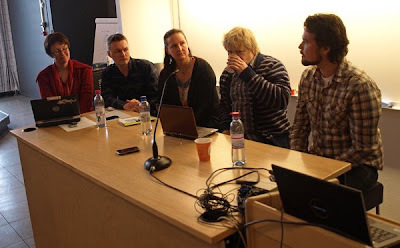 In this picture: Torill Mortensen, Faltin Karlsen, Jessica Enevold, Rune Klevjer and Snorre Bryne. Studies from NOVA on youths and computer culture - in Norwegian mostly. NRK interview with Ole Jensen, concerned grandfather, Dagfinn Nordbø, childrens ward specialist, Leila Torgersen, researcher and psycholog and Rita Brudalen, from the Norwegian Media Authority: Verdibørsen, 24 januar 2009. Dagfinn Nordbø argued against the idea that children are so impressionable that they don't see the difference between games and society. Leila Torgersen presented her study of 12000 children and youngsters, and their use of computer games. She had found that children who are interested in violence in general are also interested in violent computer games, and that children from families that did not interfer with the childrens' media consumption and let them play as much and what ever they liked had a slightly higher preference for violent solutions after a some years. It was however not possible to establish a causal relationship between violent computer games and violence in real life. She had a few very important points to add: Over the last 10 years youth violence has been decreasing in Norway, it is not increasing. In the same period children report less loneliness. This is the opposite tendency of the myths about the lonely, violent youths produced by the increasing use of computer games. An interesting curiosity: Action games where the player identifies with a character who needs to solve his problem through violence showed a slightly larger tendency to create positive thoughts about violence than the much more directly violent first-person shooters. The difference was not big, we are talking small margins here, but it does change a few ideas about what kind of violence is really violent. Her findings are also supported by C. J. Fergusons findings in his study of school shooters, which I wrote about recently. Active gamers and health: Swedish research, which I wrote about in 2008. Ragnhild Tronstad's blogpost about "interested or addicted" - "Hekta eller avhengig" at forskning.no. A good discussion about addiction and overwhelming interest, and the importance of making a distinction. Here she refers to the report by Jonas Linderoth and Ulrika Bennersted: "Att leva i World of Warcraft". This is a study of very active World of Warcraft players, where ten young players describe their lives.